Well, it’s certainly been a while since I’ve posted something! I mostly just use my Instagram now (@thepetitebeet) but am hoping to carve out a little time again to post my full recipes here. 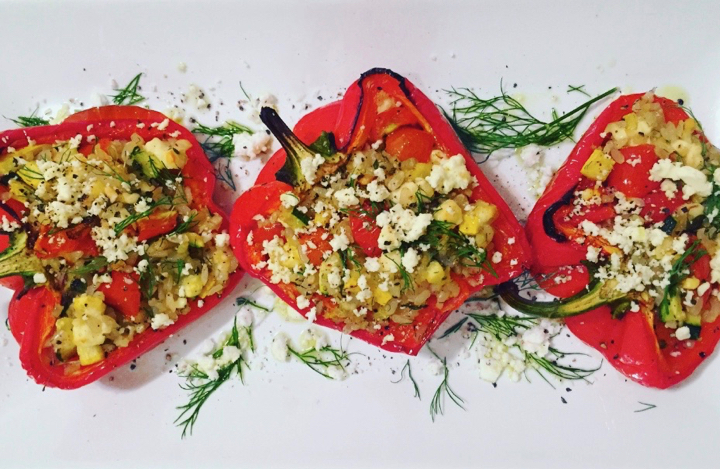 Last night I made some stuffed peppers, using all the fresh summer veggies and herbs I had on hand. They were very quick to make, and really delicious. Not sure it was the best idea to turn my oven on in 90 degree weather, but the end result was worth it! Preheat the oven to 400 degrees. 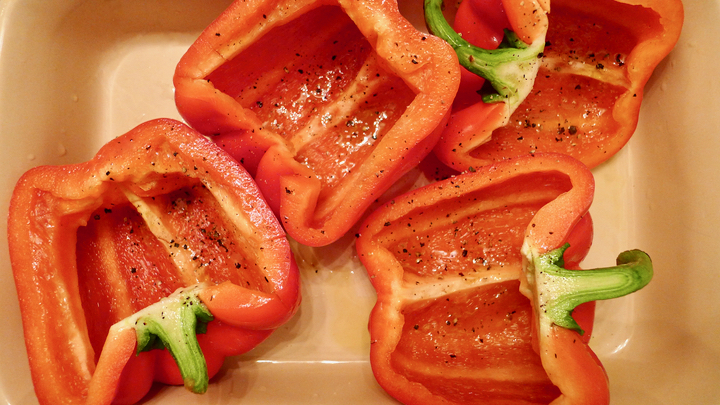 Nestle the peppers in a oven proof dish, then drizzle with olive oil, salt and pepper. Place in the oven to get those cooking. In the meantime, make the filling. 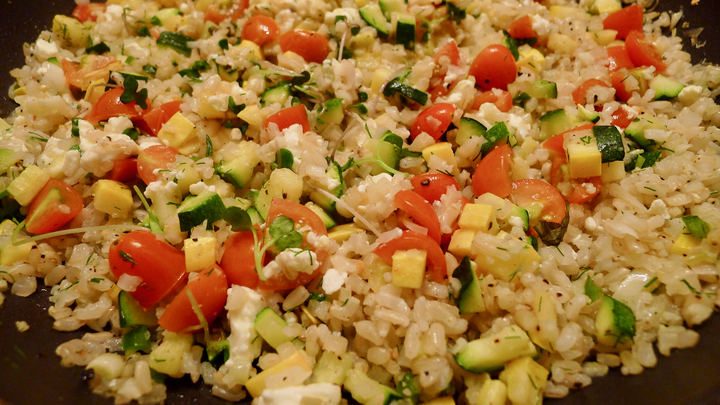 Start by sautéeing the garlic, shallot, jalapeno, and zucchini. Cook until softened. Add the frozen cauliflower rice and brown rice (I buy both at Whole Foods) and stir together, then salt and pepper to taste. 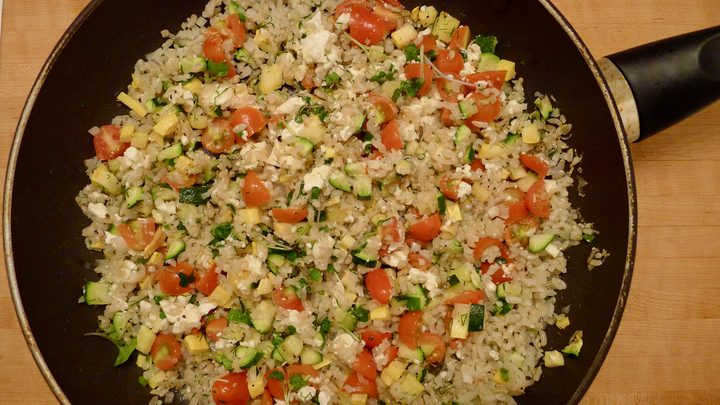 Once the rices is cooked, add the tomatoes, green onion, dill, basil, greens, and feta cheese. Cook for a few more minutes until full incorporated. 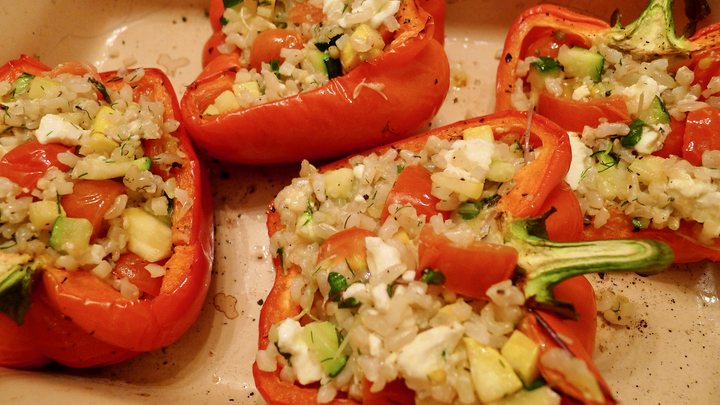 Remove the peppers from the oven, and carefully fill them with the rice mixture. Place back in the oven for 10 minutes. Let cool slightly, then dig in! This sounds awesome! I can’t wait to try it! The Beet is back!! These look fantastic! Can’t wait to (have someone) make them!